This isn’t a true “Dupe” post, or a look for less post … because its very apparent from the bottles that these 3 polishes are different. 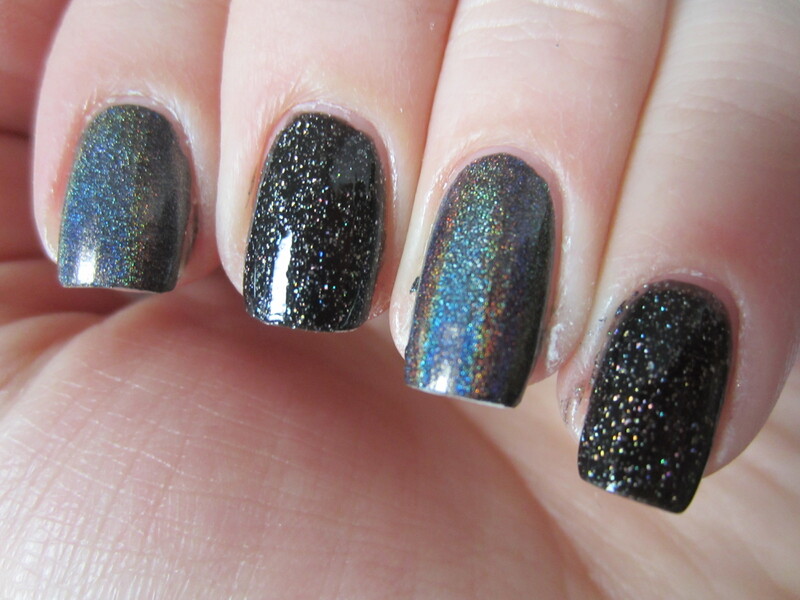 But I did notice that I have a lot of black or almost black holographic polishes in my collection! So I decided to do a “Battle” style post, where I show you guys 3 different polishes that fall into a similar category to see which one you and I like the best. First lets take a look at each individual polish! Zoya “Storm” is a black scattered holographic! This is definitely a true black and the scattered holographic pieces look like stars in the night sky. It almost looks gritty when you aren’t in bright lights to catchall the rainbow coming off your nails! Just looking at this swatch makes me want to put it on again. Its completely opaque in 2 coats, dries fast, and has a glossy finish even without a top coat. Color Club “Beyond” is a dark charcoal grey linear holographic. The difference between a scattered holographic and a linear holographic is that the linear one creates a rainbow in a line formation and the scattered (like Storm above) is just random all over the nail. The formula on this polish is fantastic! Opaque in 1 coat and super fast drying. I absolutely love it and it gives a strong full rainbow spectrum. 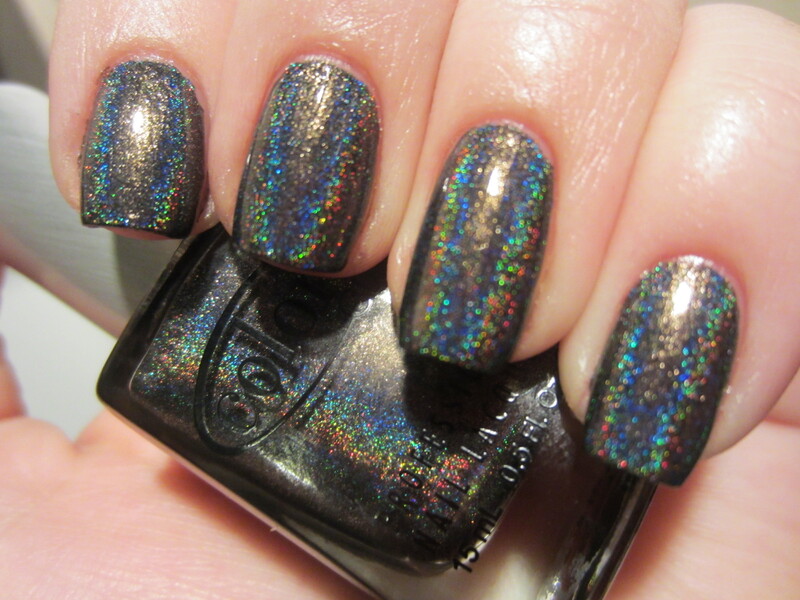 Color Club “Revvvolution” is also a dark charcoal grey linear holographic. The difference between this one and Beyond, above, is that this isn’t as strong of a holo. However, my picture above doesn’t do this polish justice! The pictures below capture it much better. Its opaque in just 1 coat, and dries really quickly! And now on to the comparison! You can tell here the difference between a scattered and linear holographic. Also, you can tell here that the Color Club polish isn’t as dark as you might think from looking at it in the bottle. It isn’t a true black holographic, but still a really pretty dark grey! Next to Revvvolution, Beyond looks darker! Its funny how that works sometimes. Revvvolution is holographic, but looks whimpy next to Beyond. However, Revvvolution has a softness that is really nice. 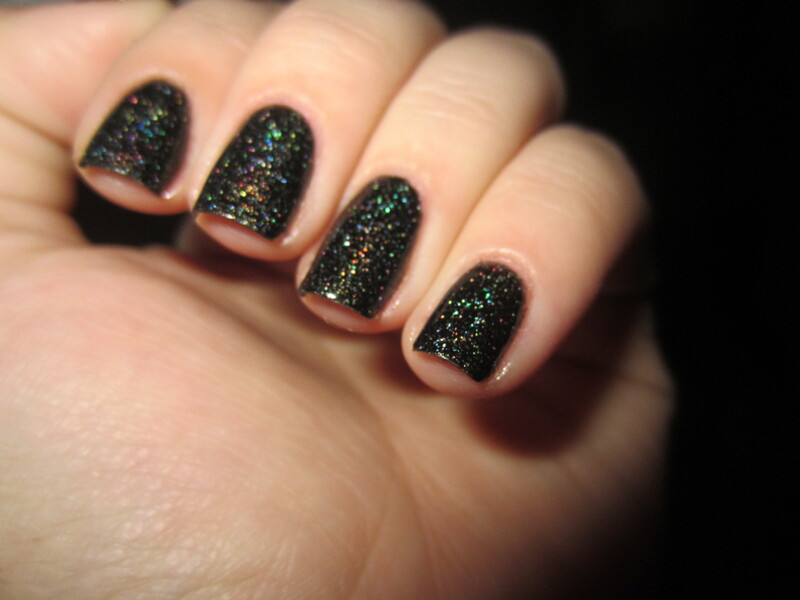 It isn’t as harsh on your nails as a black or dark charcoal, and may be a little more wearable. I guess this post is just to show that there can be a wide spectrum of holographics out there, even though they all fit under the same finish. And even though the base colors are all similar they all have their own beauty! I can’t pick one over the other because I like them all for different reasons. They’re all beautiful in their own way. Which one is your favorite? Do you have any of these? 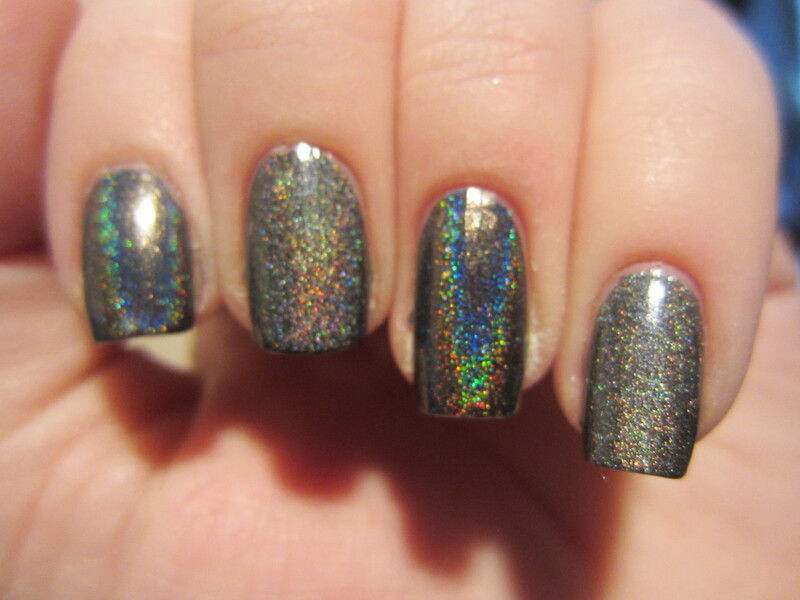 What is your favorite black or dark grey holographic? ← May Favorites! with some Empties! I ran upstairs to check which color club holo I had so I could comment accurately, hahaha, Toby thinks I’m crazy. Anyways, I have beyond! And yay, I’m glad I purchased Beyond over Revvvolution. 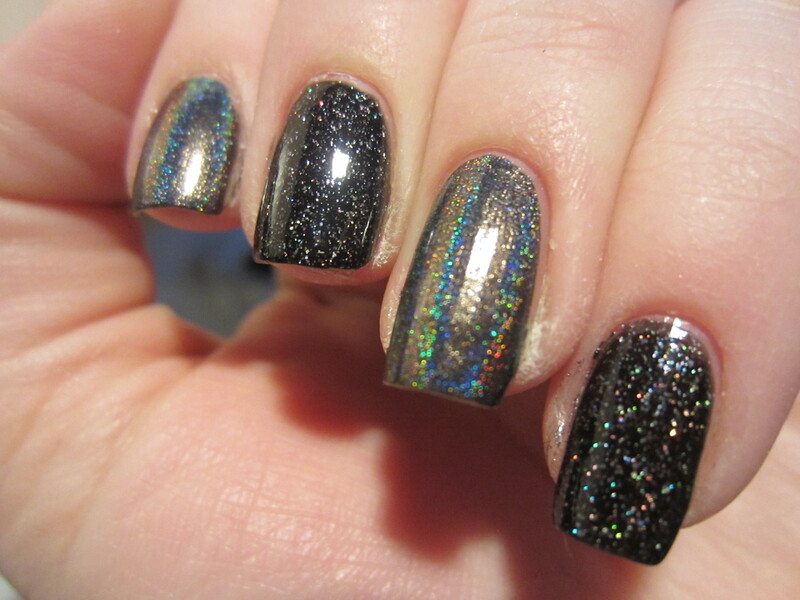 I like the Zoya one but it’s more black with holo glitter instead of a straight holographic polish. I almost got a few colored holographic polishes from Color Club but my mom kept telling me it would make my complexion/hand look “dirty” I think it was just too flashy for her. lol my boyfriend always says the same thing! whenever i’m sitting there and need to respond to a comment or write about something and can’t remember the name i’ll run up to the bathroom like 3 times. i bet beyond looks awesome on you! My in-laws live in Celina, south of Lima. (If we get to go to Lima shopping, that’s usually the big excitement of the trip!) I was sorry to come home to Texas because I love the weather up there in the summer. Someday I’m going to be a snowbird and spend winters down here and summers up there. The L.A. 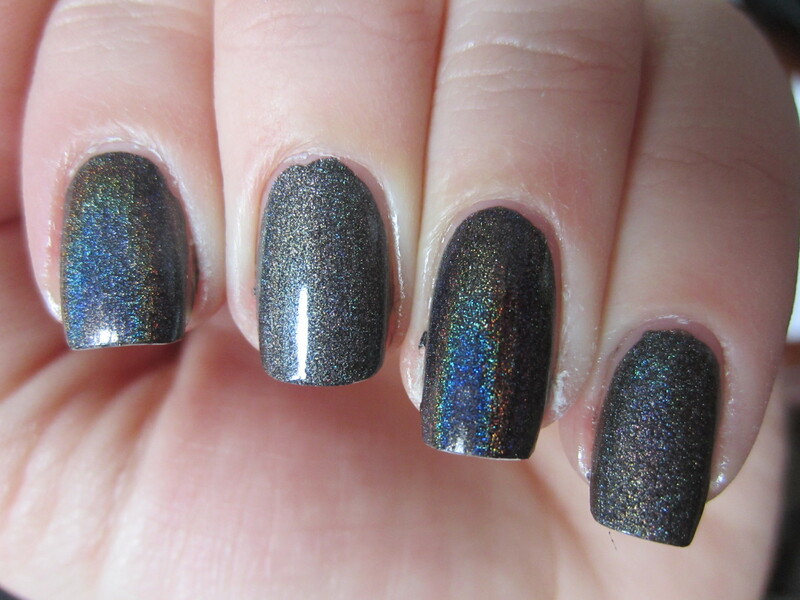 Girls black holo actually turned out to be really pretty, and somebody online – somewhere, I’ve forgotten where now – did a comparison and said it’s pretty much a dead dupe for Storm. I didn’t know what I was getting when I bought it so I was really pleased! that sounds perfect actually. everyone in cleveland (where i live) talks about doing that, spending summers up in cleveland and the winters down south. if only i decided to be a teacher, then i could actually make my “weather living” dreams work! Great comparison! I like Storm best. And thank you for explaining the difference between linear and scattered holos; I’ve always seen the terms but never knew what they meant! awww thanks girl! sometimes the easiest way to explain the difference between the 2 is seeing them side by side. storm is definitely a stunning polish, and a good alternative to a traditional black. thanks for commenting!